FOX is one of the largest and most popular TV broadcasters in the US. You’ll find sports, news, and entertainment through FOX, making it an essential channel to have for TV watchers. But if you’re cutting the cord, you’ll lose access to FOX without cable — unless you’re using the right service or TV viewing method. Below, we’ll explore your top 10 options to watch FOX without cable, including low-cost streaming services and even some free options. Where Can I Watch FOX Without Cable? Among these options, you’ll find a fair mixture of low-cost streaming and unique features. You may even get free streaming if you choose to go that route and it’s available to you. Because FOX coverage varies based on your area, we also recommend you use local channel lookup tools available with each service before diving in. Let’s explore each service and option in more detail. If you’re looking for FOX because of its sports coverage, fuboTV is going to be a good choice for you. 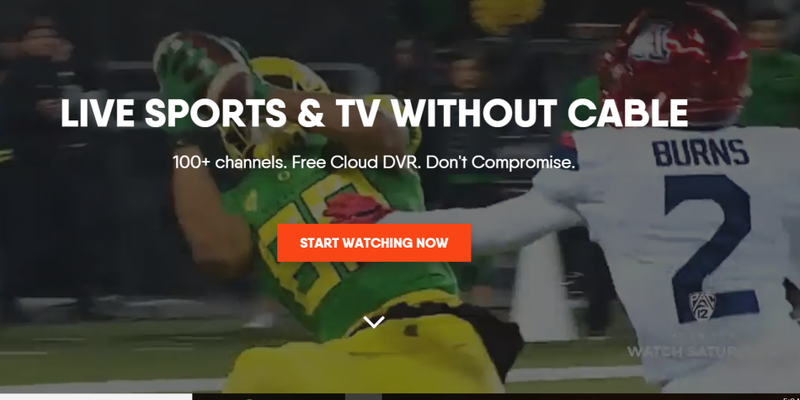 Not only does fuboTV offer FOX without cable, but it includes a huge line-up of sports channels, as well as an even larger selection of entertainment and news channels. FuboTV is a sports-centric option, but it also carries dozens of non-sports networks, including FOX, CBS, AMC, A&E, AMC, SYFY and more. The service provides two key channel packages to its customers: “fubo” and “fubo Extra”. The $44.99 per month “fubo” package is the one you’ll need if your primary goal is to get FOX without cable. You’ll get 80+ channels, depending on where you live. And you can easily check to see if this package carries your local FOX affiliate just by connecting to the site with your location services activated on either your mobile device or your web browser. Should you want even more channels (mostly entertainment), you can instead opt for the “fubo Extra” package for $49.99 per month. That will land you over 100 channels in some locations. Again, that’s not needed if you just need your local FOX affiliate, but if you’re a cable TV junkie, it’s a good cable replacement that’s far less than your cable package offering a similar number of channels. If you’re on the fence about fuboTV, you may find its features and extras are what push into trying it on using the 7-day free trial. fuboTV has pretty good features. You’ll get 2 simultaneous streams, which is fairly standard in the market for this type of service. You can increase that to 3 streams using fuboTV’s Family Share Add-on for $5.99 extra per month. This service also offers a rather good 30-hour cloud DVR. You can also keep your shows indefinitely, making it among the best cloud DVR options on the market that comes included with the base price. If 30 hours isn’t enough for you (especially considering you can keep your videos forever), you can upgrade to a rather impressive 500 hours of cloud storage for $9.99 per month extra. FuboTV also has wide device coverage. You can stream directly from the web on Windows or Mac computers, or natively from apps for Apple TV, Amazon Fire TV or Fire TV Stick, Roku, Chromecast, and iOS or Android. If you choose to use a cord-cutting streaming service, Sling TV is going to be one of your cheapest options to get FOX without cable. This service carries FOX for just $25 per month, among other news, sports, and entertainment channels. Sling TV seemingly keeps things simple with just a few channel packages on offer. That said, the mixing and matching of channels in the packages can be a bit confusing. Sling TV also has the most extensive list channel add-ons that you’ll find, so this can easily complicate things if you’re not careful. Sling TV’s two basic channel packages, Sling Orange and Sling Blue, both cost just $25 per month, while you can combine the two packages into one for $40 per month. If you can FOX, you’ll need to subscribe to Sling Blue. Through Sling Blue, you get FOX as well as several other FOX-owned networks, such as FOX Sports 1 and 2, FX, and FXX, as well as other must-haves like Discovery Channel, History Channel, AMC, and A&E. In all, Sling Blue comes with around 45 channels, depending on where you live. You can use Sling TV’s channel lookup tool to determine if it offers a local FOX affiliate in your area. Sling TV set the standard for what features services should offer, but it doesn’t have the best suite. That said, you’ll still find a lot of value in it for the relatively low cost. With Sling Blue, you’ll be able to stream from 3 devices at once. That’s more than most services offer without paying extra. Thankfully, that’s also more than you’d get if you had to go with Sling Orange, which only provides 1 device stream per account. Unfortunately, while Sling TV does have a cloud DVR option, it’s only available for an extra cost. You can pay $5 extra per month to get Sling’s 50-hour cloud DVR. On a positive note, though, that still only puts you at $30 per month, which is very affordable compared to cable. If you opt for Sling TV, you can try it out for 7 days without paying a dime. You can also stream directly from a large library of available apps, including those natively available for iOS and Android, Apple TV, Android TV, Roku, Chromecast, Amazon Fire TV, several smart TVs, and a few other devices. You can also stream directly from your web browser on Windows or Mac computers. Hulu is a growing powerhouse in the cord-cutting marketplace, with its on-demand service easily rivaling Netflix. Now, however, you can sign up to Hulu with Live TV for a relatively low cost in order to get FOX and a load of other channels and features. Hulu with Live TV offers just one, easy-to-understand channel package. You can sign up to the service for $39.99 per month in order to get 50-70+ channels, which may include your local FOX affiliate. Hulu offers a ZIP code lookup tool directly on its homepage that will let you know exactly which channels are offered in your area. Should you find Hulu offers FOX for you, it’s a potentially good option to explore. You’ll also get popular cable networks such as Discovery Channel, Food Network, ESPN, FOX Sports, AMC, and more. Hulu’s features are one of the best reasons to choose this option. We’ve found it to be one of the best on the market on this end, although there are some costly limitations. For the price, you’ll get access to the entire Hulu on-demand streaming library. That includes popular shows like Handmaid’s Tale and Harlots, as well as the growing library of anime and movies available through the service. You’ll also get a 50-hour unlimited cloud DVR, and 2 simultaneous device streams. If 50 hours of storage and 2 device streams aren’t enough, Hulu offers add-ons that can boost both of those (up to 200 hours of DVR storage, and an unlimited number of streams on your home WiFi, plus 3 outside of your home network). However, both of Hulu’s add-ons are pricey at around $15 per month extra. You can combine both for $20/month. You try Hulu with Live TV using its 7-day free trial, and you can stream your videos and live TV on iOS, Android, Roku, Chromecast, Amazon Fire TV, Apple TV, Xbox One, Nintendo Switch, and your web browser. You may be familiar with YouTube, but you may not be familiar with YouTube TV. This is Google’s entry into the live TV streaming market, and it’s a pretty strong entry at that. Similar to Hulu with Live TV, YouTube keeps things simple with a single streaming package. You can purchase YouTube TV for $40 per month and get 60+ channels, depending on your location. YouTube TV offers a simple ZIP code lookup on its main page that will let you know if you can get a local FOX affiliate through the service. If you can’t get FOX, another service may carry it, but you may also find that you can’t get YouTube TV at all as the service has not yet rolled out to the entire country. If you’re in rural America, you might be completely out of luck with YouTube TV. Feature-wise, YouTube TV is one of the best options on the market. If the stars align and you can both get YouTube TV and get FOX through YouTube TV, you’ll able to enjoy 3 simultaneous device streams per account, an unlimited DVR that doesn’t expire your videos for 9 months, and the option to create 6 unique user profiles. What’s more, each profile gets its own unlimited DVR. You can try YouTube with its 7-day free trial, and watch it on your web browser, iOS, Android, Apple TV, Roku, Chromecast, and a number of smart TVs. The biggest device drawback is that Google and Amazon have yet to resolve their on-going issues, so you won’t find a native app for the popular Amazon Fire TV or Fire TV Stick. Sony has been struggling to get attention to its PlayStation Vue service, mostly because the name throws people for a loop. Yes, you can use PlayStation Vue without having a PlayStation, and you may be able to get FOX without cable through it as well. If you want to get FOX, you’ll only need the lower-cost “Access” package. You can check to see if PS Vue offers a FOX affiliate in your area by connecting to the website with your location services activated. Otherwise, you can use the ZIP code search bar on the top right of the PlayStation Vue homepage to check any location. “Access” includes FOX, where available, as well as a good number of popular entertainment, sports, and news channels. Features are the name of the game with PlayStation Vue. Through this service, you’ll be able to have up to 5 different devices streaming at the same time from your account. Additionally, you can have 10 separate user profiles with their own preferences and settings. Cloud DVR is available through PlayStation Vue as well. You’ll get a 28-day cloud DVR, so your videos won’t actually last that long. However, PS Vue does offer unlimited storage during that time period, which is good considering the number of users you can add to an account. PlayStation Vue has the most restrictive free trial period at just 5 days, but it’s available for new users. You can also stream on a good number of devices, including (of course) PlayStation 3 and 4 consoles, Amazon Fire TV, Apple TV, Roku, web browsers, and more. If you’re interested in PlayStation Vue, you may want to take a look at DirecTV Now as well. The two services have a similar package setup, although DirecTV Now is definitely an inferior service when it comes to added features. As with other services, the least-expensive option will get you your local FOX affiliate, if it’s carried in your area. You can sign up to the “Live A Little” package to get access to FOX. DirecTV Now has a local channel lookup tool to help you determine if you’ll get FOX in your area. We mentioned DirecTV Now and PS Vue are similar everywhere but the features. Here’s why. With DirecTV Now, you’ll get 2 simultaneous streams, which is standard across most of the services, but still very low. You’ll also only get a 20-hour cloud DVR, which is the absolute lowest storage limit on the market. As a bit of a kick-in-the-teeth, DirecTV Now also restricts you to a 30-day expiration date on your recorded videos. You can add a third stream with DirecTV Now for $5 extra per month, but you can’t up that streaming limit or extend the expiration date on the videos. Thankfully, DirecTV Now has a 7-day free trial, and it also has extensive device coverage. You can stream on most popular streaming devices, like Roku, Amazon Fire TV, Apple TV, and Chromecast, as well as a handful of smart TVs and directly from your web browser, among other options. Getting FOX through one of the above cord-cutting options is the easiest and safest method to cut the cord. But those aren’t the only options you’ll find. The following services and options are also available if you’re looking to enjoy FOX content live or on-demand. Locast: A free internet TV streaming service that provides live broadcasts of local affiliates in a half-dozen large markets. Location services required to verify location. Hulu: If you only want on-demand video, Hulu has most of what you need. It has a large library of FOX branded content that you can get for just $7.99 per month. Yahoo! View: If you don’t want to pay a dime, Yahoo! View carries a large library of Hulu’s on-demand content. You’ll need to watch a few ads, but this is a great way to still get some of FOX’s hit shows without the cost and legally. Over-the-air digital antennas are a great option to get live broadcasts of popular TV networks. You won’t get cable TV, but you will get channels like FOX, CBS, NBC, ABC, My9 and CW, among others. That is, of course, assuming that your local affiliate’s digital, over-the-air broadcasts reach your home without interruption. Over-the-air digital antennas are easy to set up and can be paired with DVRs to help record shows as well. Sling TV actually sells starter packs for those looking to pair its service with an OTA setup.